"The Monster Burner breaks down monster design into managable steps, rips the hood off the BW game engine to show us how it all works, and gives us amazingly vivid nonhuman races." " Burning Wheel's Monster Burner adds a whole new level to Luke Crane's amazing and high energy fantasy RPG"
"Monster Burner is so cool that I was just admitted to be my local ER for frostbitten fingers." "MB - This thing is what the old Monster Manuals should have been back in the day. Sure it gives you stats and crap, but most importantly it tells you, step-by-step, how to do it your own damn self." 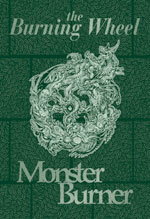 "Monster Burner shows exactly the strengths of Luke Crane's lifepath-based chargen system, by allowing players to play those strange "races" they're always interested in, and by giving a solid feel to the monsters involved. Excellent work." "Monster Burner is the definition of what a good supplement should be." "MB: Another great addition to the Monster Burner system, by the inestimable Luke Crane." "MONSTER BURNER is a fully-thought-out approach to the bestiary, as well as a superb "Burning Wheel Handbook" and system tutelary." "Monster Burner is a monster effort. The result are a suite of monsters that are more than the sum of their stats." "Luke's Monster Burner is an intesely informative product in that not only does it give you what you need to make the functional parts of play, but it shows you the theory behind it all so that informed decisions can be made." "Monster Burner is no mere encyclopaedia, but a huge, fun playground for Burning Wheel GMs."